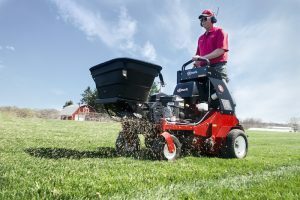 Exmark introduced a spreader attachment for its 30-inch stand-on aerator, enabling landscape professionals to offer over-seeding in conjunction with aeration programs. With a hopper capable of carrying up to 80 pounds of seed, the spreader attachment also comes standard with a hopper cover to keep material dry and in the hopper during transport. Once installed, the spreader can be removed from the aerator without tools, typically in less than two minutes, according to the manufacturer.